Me and Maya love to wrestle on the bed! After our quick trip through the border, we pointed the Big Truck straight towards Antigua, and didn’t stop until we arrived. Antigua Guatemala is a great human city, one we spent a bunch of time in during our journey south (you can check the details out here), and we were more than grateful to return. 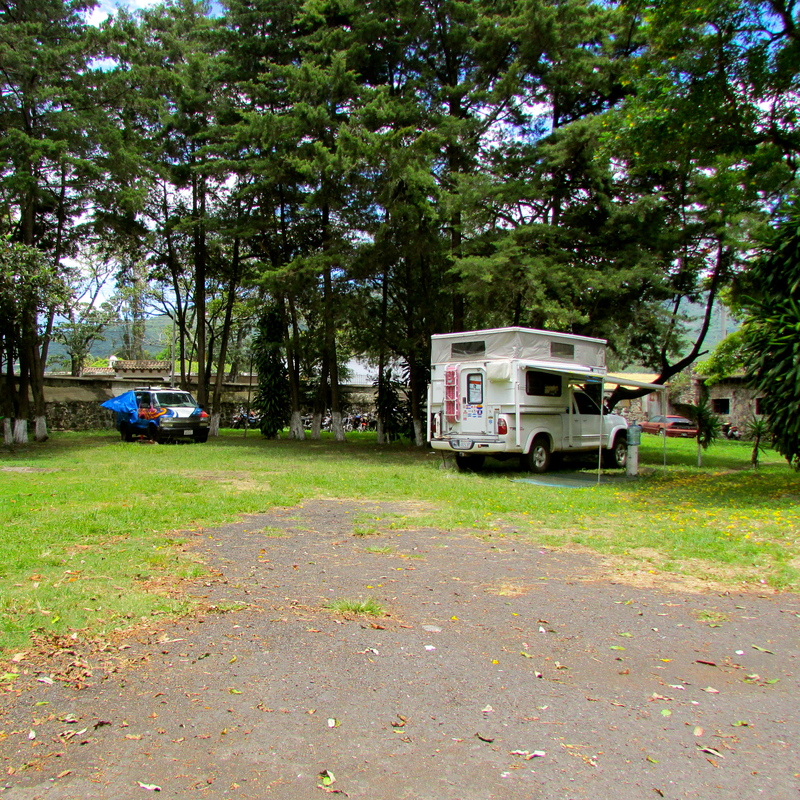 We parked once again at the Tourist Police, a nice grassy field patrolled by smiling officers and scattered campers. Exhausted after our long day of border crossing and driving, I was ready to snuggle up and call it a day. Victoria’s back, however, disagreed with me. All the driving time had left her in a bunch of pain, so we ventured out into the city to find a pharmacy that might have something to make her feel better. Two stops later and we were back at the campsite. The next couple of days were a blur of boredom. Victoria was super duper sore, and any time she’s not feeling well I end up on constant High Alert. I tried to snuggle up with her and lick her nose a bunch, but even that didn’t seem to make her feel better. Jason kept wandering out into Antigua to try and find something to help her out. Nothing was making much of a difference. I had been so excited to revisit this beautiful place, but our week in Antigua was basically spent in the camper or out on the grass, keeping Victoria company. Jason ventured out to work, to buy groceries and to look for a good massage place for Victoria. That was about it. So instead of wandering the parks, sniffing the local dogs and hanging out in the restaurants, Maya and I were reduced to whining for leftovers and worrying about Victoria. No one slept well this week, and I was starting to wonder if the adventurous portion of the Big Adventure was well and truly over. The only bright spot was the couple of nights we hung out with Adam and Rikki, cool travelers who kept us company at the tourist police. Here we are parked at the Tourist Police. Look at all that space for running around! Finally, Jason decided to pull the plug on our failed Antigua trip. He and Victoria had thought about possibly finding an apartment here to hunker down and let some of the rainy season pass us by. With Victoria laid up and Jason having to work, clean and keep us all fed basically solo, there was never any time to research and explore. So instead of sitting around the campsite for another week (with what My Family said was possibly the most devastatingly terrible bathrooms and ice cold showers they had ever come across), Jason packed up the camper and we set out for another return trip: to Lake Atitlan. The drive to the lake is one I plan on forgetting quickly. Victoria was miserable, and Jason was more than a little bit stressed out. 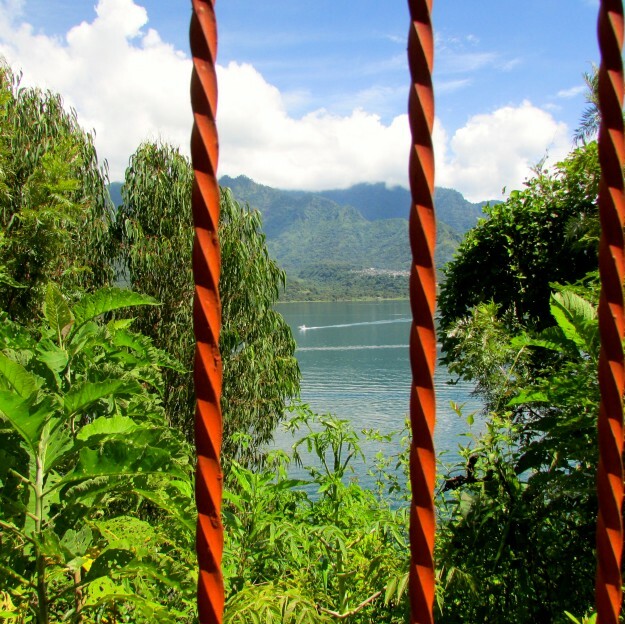 Lake Atitlan is an incredible place (you can read about our last trip there here), a massive lake surrounded by volcanoes with super cool towns all around it. But it also features some of the steepest, most treacherous roads we’ve encountered. On our previous trip here we almost lost the brakes on the Big Truck, and Jason smelled of residual fear and anxiety for the whole next day. This time around we were certainly pros, but at this point, months into the rainy season the roads were disastrous. We bounced and braced our way down steep inclines, around ridiculous switchbacks and through narrow, cobblestone streets until we finally arrived back in San Pedro, one of our favorite stops on our way south. We pulled into Cafe Chiyuasani, a coffee shop/pool/parking lot where we had spent a week previously. The owners remembered us, and couldn’t believe how big Maya was. This was Maya’s first campsite when she was a little baby, small enough to fit in Jason’s hand. Now Jason and Victoria have to lift her with two hands and sling her against their shoulders to pick her up! Anyway, we took our old spot, set up, had some food and relaxed. The journey was hard, and not so great for Victoria’s back, but we got there in one piece and snuggled up early for bed. Our first two weeks in San Pedro were spent sampling all of our favorite restaurants, relearning the town and trying to find some sort of cure for Victoria’s pain. Between the croissants, barbecue, kung pao and guatemalan tacos there were massages, acupuncture treatments, internet research and muscle relaxers. Slowly but surely, Victoria started to feel better. Sitting still for a while probably had something to do with it, as well as the super nice people and laid back atmosphere, but whatever did the trick I was sure happy about it. Victoria started to smell less tired and strained and more relaxed and happy. My nose licks started doing the trick, and our walks around town got longer and longer. We were cooking more, staying up later, meeting more people and even dancing a little bit! After so little fun from El Salvador on, I was pretty darn happy about our change in fortunes. Things got better for Maya and I as well. The Cafe is set on a wide stretch of lawn, and since it’s all gated in My Family let us run around off leash a bunch. Maya likes to pounce in my direction and then dash off, egging me into chasing her. I bark and bark, even though I kinda like this game. She’s getting really big now, and I can’t catch her anymore. I’m definitely still the older sister, though. If I want a toy she’s running after, she gives it to me no questions asked. As it should be. 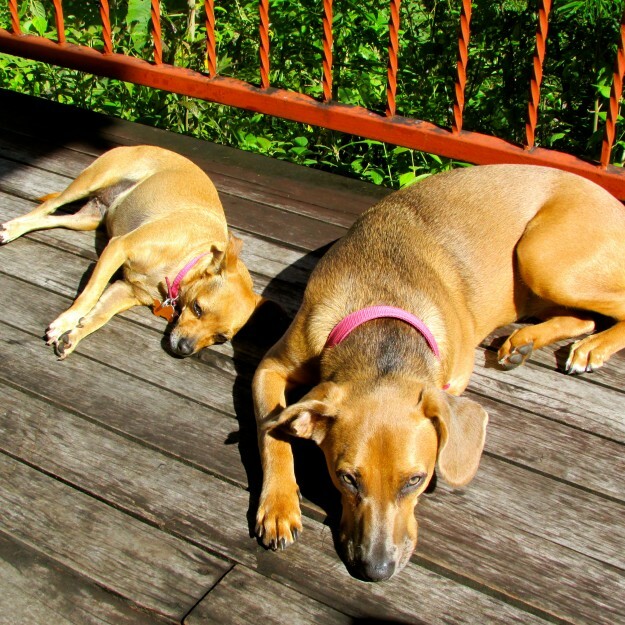 A couple weeks into our stay in San Pedro, My Family made the decision to stay a bit longer. Jason met a nice girl at the Sunday barbecue at the coffee shop, and she offered to give Victoria a job at her hostel. Meanwhile, My Family went house-hunting. I guess they had gotten tired of the ice cold showers at the coffee shop, and having to trudge up a hill and awkwardly hand wash dishes without a sink with running water. They found a place to move us to, and Victoria started working at Mr. Mullets, a spot we would soon get to know very well. Of course, we weren’t out of the woods yet. During Victoria’s very first day on the job, things took a turn for worse. I could sense that something funky was going on with Jason the whole previous day, and sure enough by the time Victoria got home Jason was glued to the bed. He was shivering and shaking, and Victoria said he had a bad fever. Things were just not going so well for us in the heath department! We were set to move into our new, temporary home just two days later, and Jason could barely move. He talked to some of our new friends about it, and people were concerned he had something called ‘Dengue Fever’. You know those stupid mosquitoes that bite you and leave bumps? Well, apparently they can leave something even worse behind, this fever that just sticks around. It ended up taking weeks before Jason felt better, so now Victoria’s super cautious about all of us where bugs are concerned, even us dogs. Jason did manage to get out of bed long enough to drive us to our new home, a cabin in a place called Hotel Chi-ya. This was up the hill on the outskirts of San Pedro, then down a steep driveway, down an even steeper set of stairs and into what we started calling the Wee Jungle House. My Family liked it because it had a huge window that looked right out over the lake, where you could even see a shape in the mountains that people called The Indian Nose. I liked it because it had two beds, (two!) both of which I was allowed to jump on. Maya didn’t like it at first, because Maya is basically afraid of anything new and different. Jason could barely carry anything heavier than a pillow at this point, so moving in wasn’t too much fun as Victoria had to do most of it herself. Even worse? The bathtub was cracked when we moved in, and the owners didn’t know! So after being in the Wee Jungle House for just two days we ended up having to move all of our stuff across the way to another cabin, which we called the Little Jungle House. This would be our home for the next six human weeks. 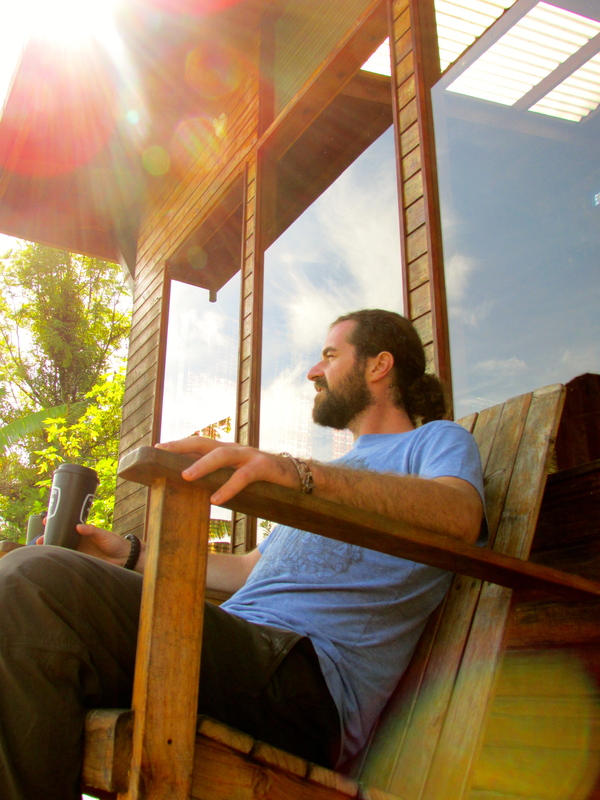 During our time in the LJH, you could almost always find Jason sitting on the deck, enjoying a cup or coffee (or a super split) and enjoying the view. At first I absolutely loved the LJH. It was HUGE, like ten times the size of our camper, with a big balcony on the outside where I could lay in the sun for hours and hours. There were also two beds here, as well as a big television! Well, that last part was more of a plus for the humans, as they got to practice their spanish watching movies in english or spanish with subtitles. Maya and I could dash around the house, chasing toys and snapping at bugs, which there were in huge numbers. After a while, however, I started to dislike, and then hate this place. First off, there was the peeing situation. There were no grassy spots for me. Everything was stone stairs and overgrown jungle. Maya could care less; she would pee anywhere (even inside the house from time to time). But I had nowhere comfy to do my business. Jason started taking us up the hill to the flat driveway every morning, something he personally dreaded before coffee. The problem was, there were two dogs who lived at the hotel, and the younger one didn’t like me at all. She kept snapping at me, and Jason even had to scramble and pick me up a couple of times. I wish he hadn’t. I totally could’ve taken her. So the terrible outside situation, coupled with the massive rainstorms that would pummel the house on a daily basis, made me miss the camper fiercely. My Family, however, fell into a happy and laid back routine. Jason would write on the deck each morning, and then move to the big table or head into town for delicious coffee during his work days. Over time he felt stronger and better, until finally his flu or Dengue was nothing but a bad memory. Victoria’s back was also feeling better every day, and she was working at Mr. Mullets three days a week, meeting a ton of great people and having a bunch of fun doing it. We’d head up the hill into the market once or twice a week, buying delicious fruits and veggies for My Family, and even found a nice vet in town who took care of the shots Maya and I were due to receive. I was feeling grumpy about the LJH and Maya’s constant pestering when out of the blue, something amazing happened. I smelled them before the door opened, and immediately perked up. It was my human grandparents, Lorna and David, here for a visit! I couldn’t have been more excited, immediately jumping from lap to lap and planting kisses until I thought my tongue was going to fall off. Maya was a bit leery at first; this was her first time meeting them and she’s always on edge when other humans are near our living space. But Lorna and David are so awesome her tail was quickly wagging. I love Lorna and David SO much! They stayed for a week, and we all had an absolute blast. Lorna and David love us a ton, so we got to go everywhere with them, to cafes and restaurants, and on long walks through town. 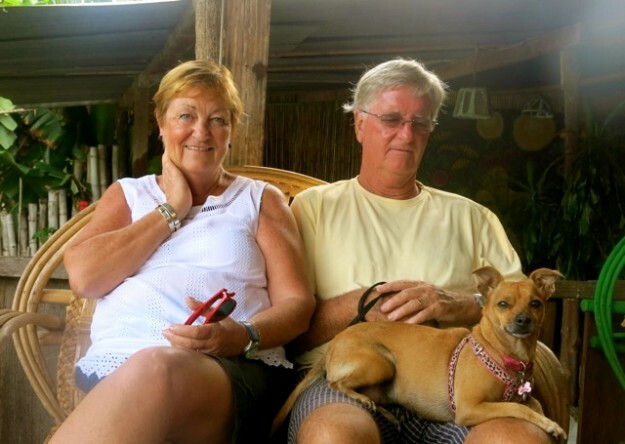 Lorna and David had seen San Pedro once before, for a quick trip on their last visit to Guatemala. Now Jason and Victoria knew the town a ton better, so they showed Lorna and David everything My Family loves about San Pedro. The bustling food market, the beautiful textile shops in neighboring San Juan, the incredible restaurants all over town (with tastes shared all around every time! ), and My Family’s group of new friends at Mr. Mullet’s. The only thing I could have lived without was the boat trip to Panajachel, a town that’s way on the other side of the lake. I turned green just as soon as we got on the boat, and Jason had to drag Maya on kicking and screaming! She had been on the water taxis when she was super young, but this time around she was just not having it. 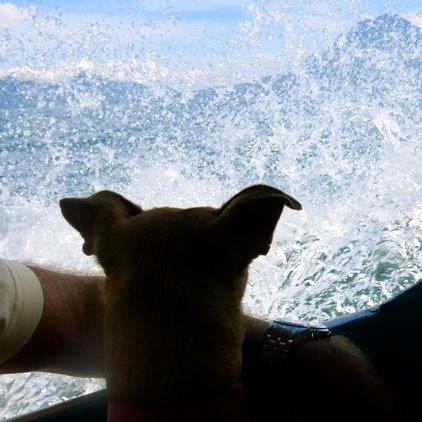 She leaped into Jason’s lap and wouldn’t move until we arrived on the far shore. We had a nice lunch and strolled through all the markets, but the ride back was even worse. The water was so rocky that we all got soaked, even after My Family helped hold a tarp up against the splashing water. Maya looked absolutely depressed when we finally got back to San Pedro, drenched and tired. Lorna and David headed home the next day, and I was seriously not thrilled to see them go. It’s always super fun when they visit, and I end up grumpy and sad for the whole first day I don’t see them. Victoria promised me they’d come and visit again when we get to Mexico, so at least I have that to look forward to! Remind me again what humans like so much about boats?! The second half of our stay at the LJH was pretty boring, honestly. We were quite a ways outside of town, and since it was now raining for huge chunks of every day, My Family ended up leaving Maya and I home a lot. We always had plenty of fresh food and water and lots of room for playing, but the days sort of blended together. I know Victoria and Jason were having a ton of fun in San Pedro, meeting great people and sometimes staying out super late, but I was rarely invited. Maya has so much energy that she just pokes and prods me until I either play with her or snap and yell her into submission. It’s not pretty. I began to count the days we’d spent in this prison-like house, and wonder when I’d be paroled. I know My Family works hard, and now that they were feeling better they deserved to enjoy where we were. But I’m pretty sure this is NELI’S BIG ADVENTURE, right? When’s my turn coming around again? No beaches, nowhere good to pee, a puppy hounding me day and night and no good way to pass the time other than trying to trap and pester the hundreds of bugs that flew in through the cracks in the doors and windows every day. Suffice to say, I was starting to go stir crazy. Worst of all, the LJH leaked every time it rained, so Maya and I got blamed for peeing in the house a couple times before Jason and Victoria figured it out. When do we get a break?! Me, caught in the act of plotting my escape from the LJH. Don’t get me wrong, there were a couple more highlights. One day, Victoria plugged in the buzzer and shaved Jason’s head! It looked like there was a bird’s nest sitting there on the patio! Maya didn’t like it at first; she’s pretty dumb and I think she couldn’t tell it was him. I liked it right away, though. Now I can lick his head as well as his face! More real estate. My Family did also take us out into town for a couple of walks, and we even visited Victoria at work a couple times. Jason and Victoria also spent many nights at home, cooking delicious meals we always got to taste. Jason would throw toys around for Maya and I for hours on end. We ran and ran, playing keep-away and bouncing from bed to bed. The LJH was leaky and wet, and the bugs were seriously nutty, but it did have it’s strong points. Near the end of our stay in the LJH Victoria celebrated her birthday! This was a super fun day, full of music and smiling faces. Victoria even had a birthday party at Mr. Mullets. We didn’t get to go, of course, but I heard all sorts of stories. Apparently, everyone dressed up like they were in Los Angeles, and Victoria got to break open a pinata. Maya and I made sure to give Victoria a bunch of extra kisses to make super sure she knew how much we love her. The next day Victoria and Jason started packing up the camper, and we hit another snag. The truck wouldn’t start. Our trusty home on wheels! Jason waved down a tuk tuk, which is basically a motorcycle taxi, to try and jumpstart the truck, but that didn’t work so well. Finally, a nice Guatemalan man dressed all in black with long curls and a big beard helped him get the truck started again. Jason said the man was a Hasidic Guatemalan, which I guess was pretty unique to him. I have no idea what that means, so I should probably look it up. Anyway, the truck was just fine after that, and the next day I was happy to watch My Family empty the LJH and finish packing up the camper. I could barely contain my excitement as we left that house behind. 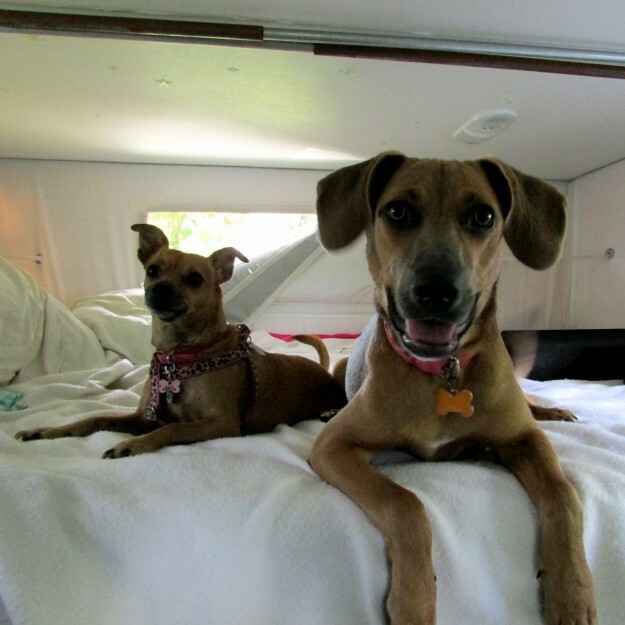 Maya and I relaxing (um, not helping to pack the camper) our last day at the LJH! I had no regrets as we watched San Pedro disappear in the rearview. I know My Family was pretty sad to leave. They had met both old and new friends, and made a ton of memories in this unique place. I was more than happy to be back on the road, however. The house I thought was so super cool ended up being terrible, and with the constant rain I barely got to do any adventuring. If a dog could die of boredom, I guess I was close. Maya, on the other hand, was not that enthusiastic. She had grown so big that she barely fit in her old perch in the truck, and suddenly she started getting car sick! 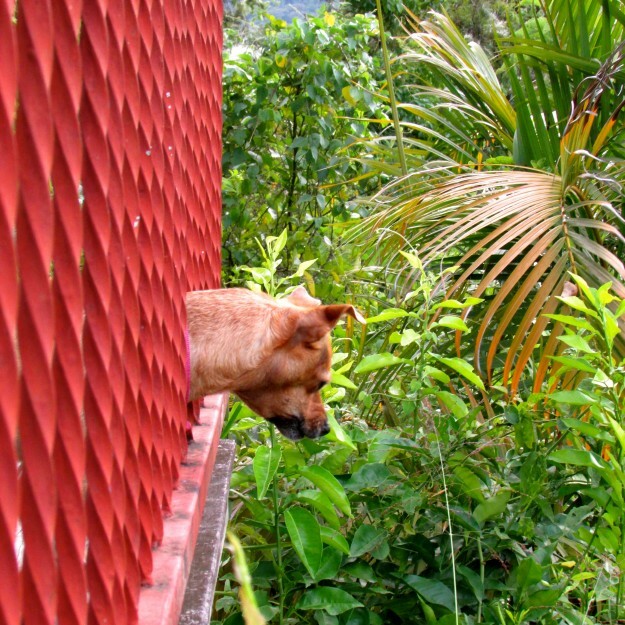 She had never had this problem before, but the entire journey away from Lake Atitlan she was a miserable, slobbery mess. She never vomited, but she soaked both herself and the bed under her with spit, and tried to jump down into the front seat at every opportunity. Victoria and Jason had no idea what to do, so it ended up being a pretty awkward drive. We left the lake and drove north, heading for the Mexican border. We had one last night in Guatemala, in the parking lot of a hotel, before slowly but surely finding the border. It’s hard to say exactly how I felt about this part of our adventure. Jason and Victoria had been dealing with a ton of sickness and pain ever since El Salvador, and nothing that terrible had happened to me. Yet I was pretty unsatisfied. Don’t get me wrong, I know now how cool a life this is for a dog. We pass dogs every single day that don’t have families, and barely get enough food or clean water to survive. I’m doing great, and Maya basically won the doggie lottery. Yet I was yearning for something more. Some time out of the rain, footloose and fancy free, hopefully with a sandy beach I could call my own. It had been a long time since I’d seen Mexico. We’ve been on the road for just over a year now, and more than nine human months of that time had been spent in Central America! That’s a lot of great memories, but we were all super excited about what was going to come next. I stood up on Victoria’s lap, sniffing the changes in the air, thrilled to see the ‘Welcome to Mexico’ sign in front of us. Hopefully this would be the end of the rough times, and a new beginning for the Big Adventure! PS: To see some of the photos My Family took during their A W E S O M E time in San Pedro, head over to our Facebook page! oh poor Neli! A low point to be sure! I’m sorry things were so tough but Mexico is always wonderful and I bet by now you’re racing on the beach and happy once again! A definite low point for this little dog! I’m happy to report we are back in Mexico and I’m going for daily beach runs, life is back to ‘normal’ again!